Banjo Bewdy began well from box eight and mustered pace to lead around the first bend. She quickly extended her gap to lead by six lengths down the back straight, before going to win by two-and-three-quarter lengths in a solid 29.67. 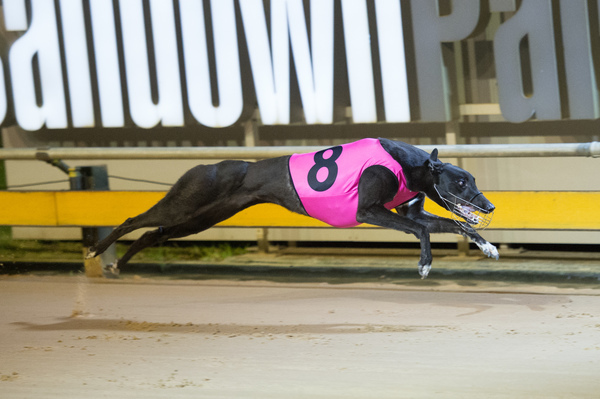 Trainer Ken Virtue was pleased to see a new side of his chaser that he hasn’t seen before. “I saw a different side of her, which was good – she accelerated and was forced to sit three wide at the turn which I thought was good – rather than just going to the front and being one-dimensional,” said Virtue. Although it was Banjo Bewdy’s first race at the track, it wasn’t her first visit having trialed exceptionally well prior to the run. “I’ve only trialed her once at Sandown and she went 4.89 to the first split, she went 5.08 last night which is alright but it’s a long way off 4.89 isn’t it?” laughed Virtue. After spending her infancy in Victoria, Banjo Bewdy was sent to New South Wales to be educated. Banjo Bewdy’s last start in NSW was back in March, she returned to Victoria shortly after.